We are so honored to have been nominated by our fantastic customers in 6 categories in the 2016 Rezzie Awards! 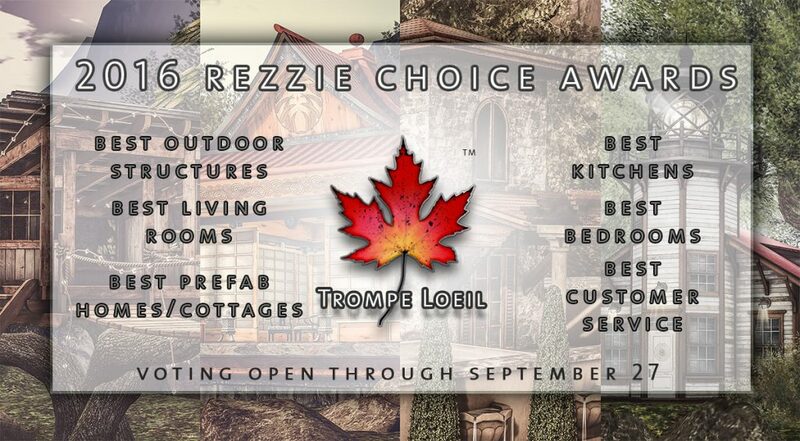 Voting is open through September 27 and Trompe Loeil is nominated in the Best Outdoor Structures, Best Living Rooms, Best Prefab Homes/Cottages, Best Kitchens, Best Bedrooms, and (our favorite) Best Customer Service categories. Be sure to stop in and vote for all your favorites before September 27 and look for winners on October 1! 50% Off Sale October 8 & 9 – Thank You for 4 Rezzie Awards!